It is time to talk shoes once again on the NBwebexpress.com blog, and the new kid on the block, the New Balance 858 arrived on our site a few weeks ago. The buzz is starting to hit! The 858 is perfect for long distance runners; so marathoners, or avid everyday runners may want to check this shoe out. With lots of great technologies that are just built for people seeking stability and durability, there are other features as well for a variety of running types. There is a dual density medial post to help moderate over-pronators stay comfortable and secure within their shoes. The 858 also has Ortholite® inserts to keep your feet comfy as you run, and ABZORB® SBS advanced cushioning for shock absorption. Another great feature is the Sure Lace™ lacing system. Sure Lace shoe laces are unique in their look and feel. The secure laces keep the shoes comfortably snug around your feet. The Lightning Dry™ collar will keep your feet dry as you heat up during a run, and the 360° Reflectivity will keep you visible on the road as it gets dark. 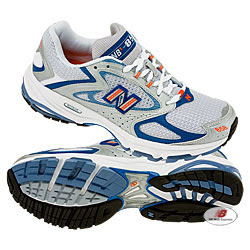 Technology and comfort in one sweet looking package, I think I'm going to like the New Balance 858. Welcome to the neighborhood.